The world has been thrust into an “X-Files” movie. It’s like we are on the verge of discovering the spaceship that agent Dana Scully studied in the Biogenesis episodes. As a skeptic, she was faced with evidence that life on Earth had its origins in outer space. Her partner Fox Mulder believed in all kinds of phenomena, but was constantly manipulated by shadow forces. One goal remained constant between them; the search for Truth. What if the truth is that life on Earth did begin in outer space? Take that spaceship that confronted Scully on the Ivory Coast, with its biblical references to Genesis, alongside verses from the Koran, and disclosure of human chromosome information. As a species, are we ready for this? What if the Bible contained many references that life began out there; or visitations were common; or prophets had close encounters? If there were extraterrestrials in the skies that appeared whenever they wanted and disappeared with ease, that would be terrifying to some. Things that we don’t understand often terrify us. Take various pseudo descriptions of UFO sightings like these: There was a sudden emergence of a large bright amber-colored oval object dropping out of the sky. The object was silvery-gold in color and traveling over 500 mph. 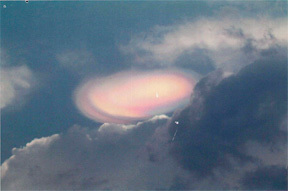 A bright orange flaming egg-shaped object spun and disappeared in the clouds. Now, look what Bible Prophet Ezekiel said back in his day, “And I looked, and, behold, a whirlwind came out of the north, a great ‘Cloud’, and a fire infolding itself, and a brightness [was] about it, and out of the midst thereof as the colour of amber, out of the midst of the fire (Ezekiel 1:4).” Similarities exist in these descriptions, even though many centuries span between them. Ezekiel wasn’t the only prophet with experiences out of the norm. Enoch, Elijah, Daniel and John were others. These events terrified them; and they often fell on their faces. They exhibited a God-fearing respect for these chariots-of-fire in the sky. Prophets also had eyes that could see and ears that could hear. Yet today, people are programmed to be deaf and blindly believe in evil aliens that plan to dominate the world. We get a conglobated media package. Information is filled with imaginations run wild; or it’s top secret and classified; or it’s reinvented all together. These tactics are commonplace and we’ve warmed up to them. As far as UFO sightings go, we haven’t learned the truth, but we can be reasonably sure that something is out there, just using the Bible as a basis. And maybe our days on this planet are really numbered. Daniel the Prophet gave us a mathematical timeline when he spoke about the treading down of Jerusalem by the Gentiles, in Daniel 12:7-8, “it shall be for a Time, Times and a Half.” He heard this sign, and he didn’t need to understand it, but we do. Christ also discussed it, “And they shall fall by the edge of the sword, and shall be led away captive into all nations: and Jerusalem shall be trodden down of the Gentiles, until ‘The Times of the Gentiles’ shall be fulfilled (Luke 21:24).” War and slavery did befall them. The 10 Tribes of the House of Israel had already been carted off to Assyria, but in Jerusalem remained the two tribes of the House of Judah. Their treading down began in 604 BC, when Nebuchadnezzar seized it and carted them off to Babylon. Jerusalem would remain under the gentile rule until this time period decreed by God was fulfilled. The Guardian Angels simply fulfill His decrees. Here’s the equation: Time + Times + A Half = 1260 days [or 360 days (suni-lunar) + Times 720 days (2 x 360) + 180 a half (36O/2)]. This means that Jerusalem would be liberated from gentile rule in 1917, as a day means a year in this prophecy. The British (of the lost Tribes of Israel) librated it from Turkish (Gentile – Edom/Esau) rule on Dec. 9, exactly to the day as prophesied 2,600 years in advance. This should shed some light on the fact that the Bible is a real guidebook or Basic Instruction Before Leaving Earth; and that the Heavens have guarded its contents. While the British don’t know they are Israel, those in the skies do, because they know where Israel was scattered. 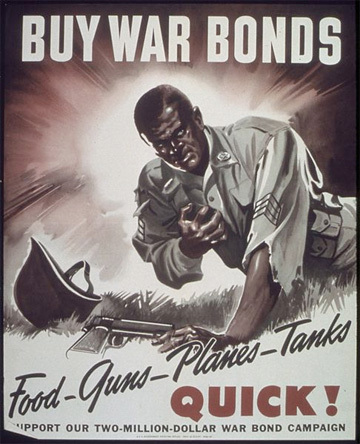 War Propaganda: ALL WARS DESTROY the EARTH and US. This liberation of Jerusalem isn’t the only clue that 1917 was a prophetic year. God also prophesied the liberation would be the same day that the beast would ascend out of the bottomless pit and make war against them (Rev. 11:7). “Day” is a prophetic code word for “year” as indicated in Scripture, “… I have appointed thee each day for a year (Ezekiel 4:6).” This code is also given in Numbers 14:34. Zionist Communism ascended out of the bottomless pit in that same year. It would take hold after the October 1917 Bolshevik Revolution in Russia, lead by Lenin and Trotsky. Trotsky lived in New York City among the many Jewish-Russian immigrants and was financed by the counterfeit-Jewish Synagogue of Satan. Later, they were ordered to change the name to the Communist Party and adopt Karl Marx’s Manifesto. It was from these Talmudic Eastern European and Russian counterfeit-Jews that the philosophy of Zionism was launched upon the world political stage. They had made their mark. One might be surprised to know how many Russian and other counterfeit-Jewish descendants or Zionists are now in places of power on today’s world stage, with their hidden agendas. All the details to these plans are documented in “The Illuminati and The Protocols” by Myron C. Fagan, sourced below. These counterfeit-Jews were and are not from the ORIGINAL House of Judah that was scattered in 604 BC. They were Ashkenazi Khazar-converts to the Judaism of the Tribe of Edom or Esau. Some people call them Edomites or Idumeans. The Edomites moved into Jerusalem after the original House of Judah was carted off to Babylon. It was these Idumean converts to Judaism who orchestrated Jesus’ crucifixion, not the Tribe of Judah. Their symbol in the Bible is the Fig Tree, while Judah’s is a Lion. Jesus knew who they were. In Matthew 15:1-20, He refers to their Talmud, as Traditions of the Elders, which is what the word “Talmud” means. He also refers to them in Revelation, “I know thy works, and tribulation, and poverty, (but thou art rich) and [I know] the blasphemy of them which say they are Jews, and are NOT, but [are] (Idumeans) the Synagogue of Satan (Rev. 2:9).” Thus, it is these converts to Talmudic-Judaism that Great Britain promised the Holy Lands to in the 1917 Balfour Declaration. That declaration was withdrawn, but it would foreshadow the actual transfer to come in 1948. Ezekiel also prophesied it. “Son of man, thy brethren, [even] thy brethren, the men of thy kindred, and all the House of Israel wholly, [are] they unto whom the inhabitants of Jerusalem have said, Get you far from the “I AM”: unto us is this land given in possession (Ezekiel 11:15).” Edom moves in on Jerusalem again, God’s Holy Land; but tells true Israel to go and stay far away. King George VI was an Israelite from the House of David (Judah), as all British monarchs have been, even Elizabeth. What splendour was in the skies in 1917? 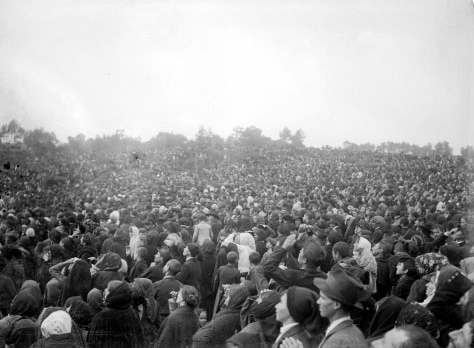 The major event occurred in Fatima, Portugal, on Saturday, Oct. 13, which about 70,000 people witnessed. It was nice that the Sabbath was chosen for the event. Unfortunately, the Catholics hijacked it, making people believe it was their Mary-god. It was probably intended that Lucia get the word out, because thousands showed up. Lucia was the little girl who had received messages about the event, but was essentially kidnapped by the Catholic Church and cloistered for the rest of her life, so she could not reveal what she was told in the Third Prophecy of Fatima – that Satan is ruling the world through the Vatican. They released their version of what happened and what this Angel-Being said to Lucia; and not surprising it spoke Catholic. Plus, it would only take a few “Catholic” people at the event to yell, “It’s the Virgin Mary” to affect the masses, because they were searching for answers in this monumental moment: even the skeptics that arrived. It could have been Uriel, or Gabriel, but it certainly wasn’t Mary, because she was buried in Glastonbury, England. Biblically, when angels have come to the Earth, they appear as men, not women. They also didn’t appear as little grey creatures, as no mention of these is in the Bible. Setting the Catholic interpretation aside, what really happened? The crowd gathered in anticipation of this splendorous event, and waited despite the rain. Then the sun shone through a thick cloud. Some saw a disk-shaped object. Some called it silver; some called it clear; and some called it a pearl. Still, another said it looked like a polished wheel that spun or whirled about itself. Others saw that it turned red, had multi-colored flashes of light and lowered in a zigzagged pattern, but said that it was hard to look at because it was so bright, like the sun. The heat of it dried their clothes almost instantly. In 1917, Europe was destitute from war engineered by the Synagogue of Satan. People were crying for peace [but there would never be any, not even with Satan’s coming union of nations. They would lie: the devils]. Great Britain was already heavily in the war, and the United States would soon be hurled into it, as planned, with the sinking of the Lusitania. The beast finally makes war with both of God’s witnesses, the UK and USA, made up of Israelites in their abundant and fruitful promised lands. But with the infiltration of the Synagogue’s communistic ideology (Marx in the mind-forehead), the witnesses had finished their testimony, prophesied in Revelation 11:3, “And I will give [power] unto my Two Witnesses (Isa. 43:12), and they shall prophesy a thousand, two hundred [and] threescore ‘days’, clothed in sackcloth.” That’s again 1260 days. And sackcloth is a symbol of humility. Interestingly, the Koran also makes reference to this beast, “And when the Word is fulfilled against them (the unjust), We shall produce from the ‘earth’ a Beast (Communism) to (face) them: he will speak to them, because mankind did not believe with certainty in Our Signs (Sura 27:82).” Just maybe their Signs have to do with God’s Word. But the Two Witnesses were lured into other beliefs, by the two faces of Zionism – communism and capitalism. They no longer fear God or His Judgements, just as the Koran indicates, “Such as fear not the meeting with Us (for Judgment) say: ‘Why are not the angels sent down to us, or (why) do we not see our Lord?’ Indeed they have an arrogant conceit of themselves, and mighty is the insolence of their disrespect! The Day they see the angels, no joy will there be to the sinners that Day: the (angels) will say: ‘There is a barrier forbidden (to you) altogether!’ (Sura 25:21-22).” The angels don’t come down to us and we don’t see the Lord, because we became stiff-necked, arrogant and conceited; and they have removed themselves; but this happened long before 1917, as we managed to insult our Heavenly God every time we got a little wiggle room to run after other gods. Then, we forget or ignore that He’s really in the Heavens watching, maybe even hovering in an Unseen Spaceship. An Interesting “UFO Case” Photo released by French Government. How did the Bible say Jesus left? He left by spaceship. “And when he had spoken these things, while they beheld, he was taken up; and a ‘Cloud’ received him out of their sight (Acts 1:9).” He constantly said He was not of this world and even said, “My kingdom is NOT OF THIS WORLD: (John 18:36).” And how does Scripture say He comes back? “Behold, he cometh with ‘Clouds’; and every eye shall see him, and they [also] which pierced him: and all kindreds of the earth shall wail because of him…(Rev. 1:7).” Could these bright clouds, or things that fly in the air, be something spiritual in the skies? An army of Holy Warriors, or their signs? If so, they must have been the Angels of Mons and the White Cavalry at Bethune during the times of WWI. And maybe they were sent because the British-Israelites decided to gain a little humility and pray whole-heartedly to the “I AM” God. He does listen. Must it always take bringing us to our knees in desperation, before we will simply bow our heads before Him? 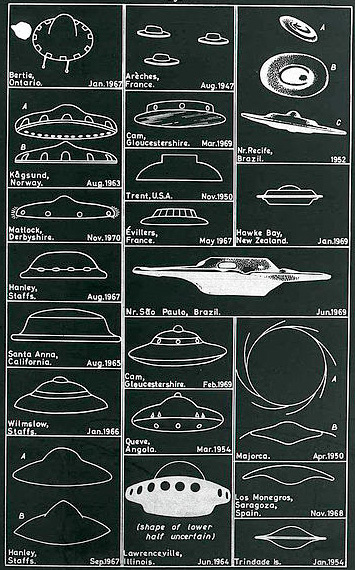 The Years of 1947-1948 ushered in a wave of modern-day UFO sightings, another Sign. By this time, the powerful governments were almost fully controlled by Satan’s Synagogue, and their Deutsch Mark (an exchange in the hand). People think the so-called chip will be the mark of the beast, when it’s just better bookkeeping for a mark that already exists and rules in Satan’s mammon-materialistic world. 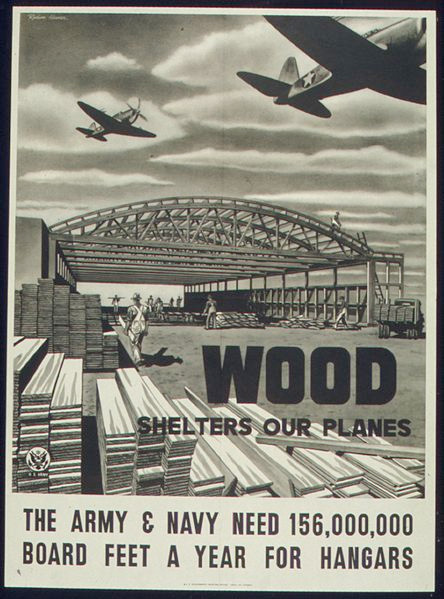 In 1945, World War II ended, but THEY have plans for a third one. It’s taken them a long time; and they get pretty mad when their plans get thwarted. If their nuclear capabilities weren’t being monitored; Satan would have already inspired someone to press the button. He has tried and the missiles were prevented from functioning, by extra-terrestrials. Satan absolutely doesn’t care if the Earth is blown to smithereens; and he hopes no one makes it off the planet, down to his right hand man. It’s God’s timing, not his. “And except those days should be shortened, there should NO flesh be saved: but for the Elect’s sake those days shall be shortened (Matt. 24:22).” Praise be to God. A sign they were shortened was with Divine Intervention, with Heavenly light splendours of the Force in 1947-48. These events were to go down for this generation of souls. Satan was also put on notice – so he quickly sent word to his black generals. Again, it took the Communist-Zionists until 1948 to take possession of the Holy Land. The wars accomplished this, but Satan likes war. He says he wants peace, but he lies. His adopted sons also lie. Christ told us when His Second Coming would be close, in the parable of the Fig Tree, if only we understood it. That’s a timeline marker that’s been decreed and fulfilled, again exactly to the day as prophesied 2000 years in advance: “… When his branch is yet tender, and putteth forth leaves, ye know that Summer [is] nigh: (Matt. 24:32).” Summer means Christ’s reign. We’re in Winter now, under Satan’s rule. The day that the Fig Tree put forth new shoots was April 22, 1948, creating its counterfeit State in Israel, which has nothing do to with the true Israel People, including Judah. If one understands how much prophecy has been fulfilled since then, he might be wondering about the Second Coming, “So likewise ye, when ye shall see all these things, know that it (the end) is near, [even] at the doors (Matt. 24:33).” Christ said He is The Door. In the skies, the angels were creating an awakening; letting us know we weren’t alone in this Universe, and that the time of the Second Coming was drawing near. The first reported sighting was June 24, 1947, when pilot Kenneth Arnold saw a formation of very bright objects flying at incredible speeds in Washington State (West Coast). He said they were silvery, shiny and almost like mirrors, and with a series of flashing lights. 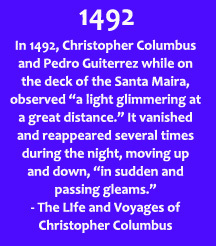 From the publication of his sighting, stories started coming in from around the country and world. Astronomers, engineers and normal folk alike were witnessing these events. One incident was with a skeptical pilot, Captain E J Smith, who discounted Arnold’s report. This made him the perfect candidate, because the Heavens must have heard him say, “I’ll believe in those discs when I see them.” On July 4, 1947, Captain E J Smith and his crew headed from Boise, Idaho, in the Midwest to Seattle, Washington. Not long after take off, his plane was accompanied by those discs, which paralleled their plane’s course. The discs could clearly move anyway they wanted, in tight formations and close ones. The Heavens were probably aware this was Independence Day. 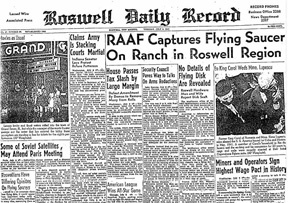 Then, a few days later, the “Roswell Crash” made the news in New Mexico. The Air Force released a statement on July 8th, that it had recovered a flying saucer, which the Roswell Daily Record published; however, the next day it was reported to have only been a weather balloon. No date is given on the actual date of the crash itself, as that story changes too. Other accounts show something happened on July 4th and possibly the 5th. But it is interesting that Friday, July 4th would lead into the Sabbath and our calendar day of Saturday, the seventh day, then recovery/discovery coinciding with July 7th. The Heavens wanted us to Take Notice. Take notice Synagogue of Satan, as well as militaries being manipulated by it. 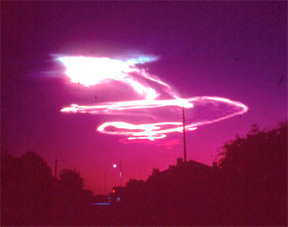 Members of the United States Air Force were seeing these circular, bright, spinning objects from Alabama to California. Next, the big cover-up begins, with Project Sign, appropriately named. By the end of July 1947, there was a security lockdown, by the U.S. government, on anything that was UFO-related. What are the details of the crash? Too much would be speculation, because, like truth websites today, the crazies come out in full-force saying this or that ruler is the antichrist; or reptoids have taken over the world; or even aliens are going to save us. In their own way, they are disinformation agents, full of fantasy. Yet, there is truth in what they say. Rulers haven’t been good for a long time; they’ve been manipulated; and they lie. They’d rather hold the moneybags, save their reputations, save their lives and a few others, while millions, soon to become billions, are being sacrificed. The evil-doers might as well be Reptilians, because they are cold-blooded and cold-hearted snakes, spewing poison. And aliens “The Unknown or Unseen” show up for Battle… then Judgement – against everyone, right down to the couch potato who doesn’t want his cheese moved. Maybe the “Roswell Crash” was symbolically a sign of an incubation-period on Earth, because nine months later, counterfeit-Israel is born. If they had found “alien” life at the crash, or landing, they would have done what we’ve been taught in our sci-fi movies. The Unknowns are hunted down – all of them from The Day the Earth Stood Still, to E.T., to the Star Man. Even Close Encounters of the Third Kind is another example of what mankind would do. The power-mongers would try to keep everything to themselves. Kind of like they’ve done with any technology given to them. “We sent aforetime our Apostles with Clear Signs and sent down with them the Book (Torah) and the Balance (of Right and Wrong) (The Covenant), that men may stand forth in justice and We sent down Iron, in which is (material for) mighty war, as well as many benefits for mankind, that “I AM” may test who it is that will help, unseen, Him and His Apostles: for “I AM” is Full of Strength, Almighty (and able to enforce His Will). (Sura 57:25).” Money and power always want money and power. Rulers are takers, not givers. And man wants to wallow and woe-is-me, and not fight for true justice against what is truly evil. Because the militaries are bought and contracted, it’s unlikely they’ll come to anyone’s aide against the moneybags. Instead, it looks like they are being gathered for battle – and will eventually be brought to Har-Meggido, in Israel in a blind effort to “save” her, yet they go up against God’s army in the skies – the one thing that’s eluded them for so many years. Perhaps God sent the Roswell craft and crashed it, to see what we would do with this relatively (to us) advanced technology. To see whether we would use it for good, or for evil – mighty war, or benefit, like iron as mentioned above. No prizes for guessing which we chose. Look around you. That’s where, amongst other things, electronics, transistors and computers came from and look at the technological prison, surveillance state, and weaponry they’ve created with them. The “Roswell Crash” incident most probably did give the moneybags some knowledge or technology to reverse engineer; or maybe they just used Tesla’s God-given research. We can see the scientific progress in their models, from airships that look like the one in The Day the Earth Stood Still, to the sleek Black Triangles of today. Isn’t it kind of odd that now they’re pyramid-shaped. We’ve also gone from the 1950 Bel Air automobiles to Thunderbirds to Corvettes; and from B-52 bombers to stealth jets to drones, with new drawings illustrating the coming triangle-shaped ones. Is there a parallel? There seems to be a parallel in what’s in the air and what’s on the ground, because the Thunderbirds are a demonstration air-force group; and corvettes are small navy warships. Thus, maybe flights of the black triangles are just test flights. Satan is preparing for the big war or Battle. It should be somewhat comforting and terrifying to know that the angels’ airships have never changed. Why reinvent what’s already perfect? 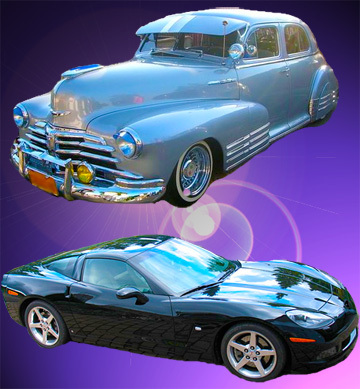 Over the centuries, the descriptions are the same – whirlwinds, spinning disks, flashing lights, bright lights, bright stars, fire in the sky, fireballs, wheels within wheels; and they fly at tremendous speeds and in any pattern and disappear in clouds. Those are still around, despite what the evil scientists put in the air. Riding High… A progression… What are they trying to hide? When fire came down on Sodom and Gomorrah and destroyed them, maybe it was an air-strike from spaceships. Let’s fly to 1952. We have another “Wave of Sightings” to get our attention. This time a fleet would fly over Washington DC (East Coast). There was both visual and radar confirmations. Sightings would begin Saturday, July 12th and continue for about three weeks. 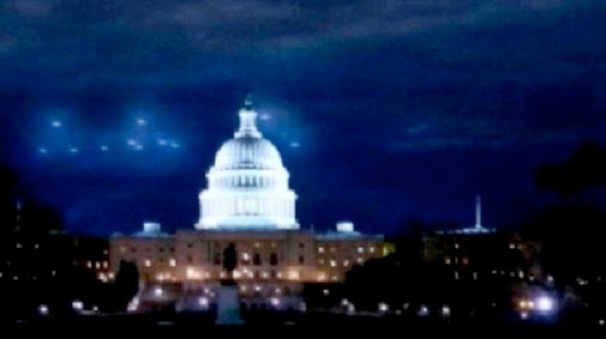 On Saturday, July 19, the series of flying objects came and was documented, even in video over the Capitol Building. Fighter-jets were scrambled to intercept the objects, yet the objects disappeared when the jets got close, but came back when the fighter-jets disengaged, or had to refuel. 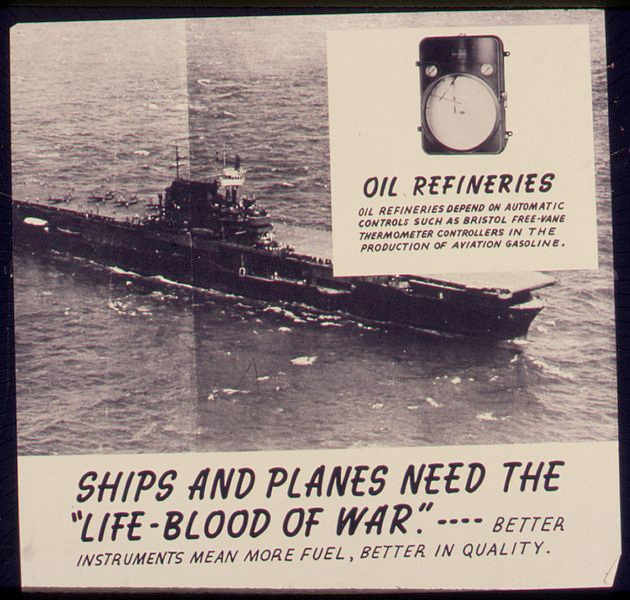 If the “superpower” military wasn’t alarmed at something it feared, why waste valuable resources? Then, exactly seven days later on the Saturday, July 26, another wave of flying objects made their appearance. Because they were seven days apart, we were supposed to take complete notice, as seven is the Biblical number of completeness. And July is the seventh month. THEY explained it away saying something about “temperature inversion”. It looks like they lost-out, again. Also, temperature inversions were very common at that time. Yet they just explain it away. Maybe Washington was being put on notice. 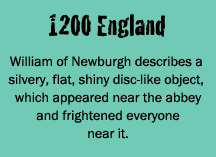 While the moneybags were at their storyboard, they probably developed the grey creatures – another enemy for us to hate. Could they have also orchestrated countless abduction incidents, because they wanted to conduct their own human experiments, and blame “someone” else with a little mind-control? Prophets were taken up to learn, not to be experimented on. The Heavenly bodies are well-aware of how these animal bodies work, since God made the vessels in the first place. The UFO community is on to something, but members forget to use the basic instruction Book. Then, they get sucked into fantasy and believe in the “Goodies and Baddies”. All human+Beings are sinners/bad. Their Beings wouldn’t be imprisoned in their cellular bodies on prison planet Earth, if they were good Beings. They’d be able to fly in the skies, just like our Guardian Angels who watch over us do. Our insurrection goes way back – before we fell and were cast here with our leader. We’re just doing time and our days are numbered and rapidly running out. 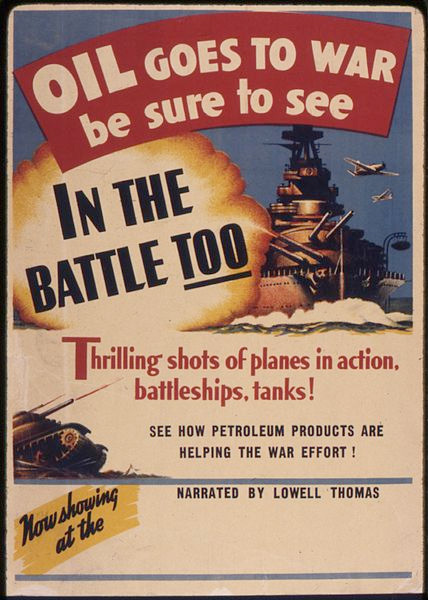 More War Propaganda (doesn’t matter which war) from Wikimedia Commons. 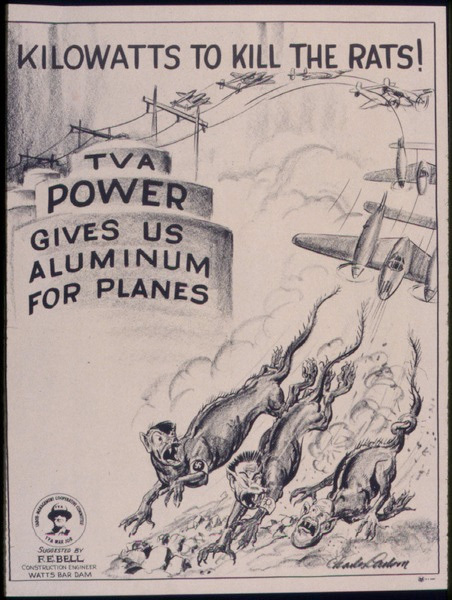 Now, let’s look at what we were doing in 1952. We were in the cold war. Russians were being programmed to hate Americans, and Americans were being programmed to hate the Russians. The same tactics are always used; and we still can’t defeat Satan or his generals. Before the Russians, we were programmed to hate the Germans; and in recent times we’ve been programmed to hate the Arabs. Now, the world hates us. Hate is a destructive tool. We don’t know what to hate; but we should probably hate what the “I AM” God hates. And maybe should hate our-SELVES for being so gullible. In 1952, Rabbi Emanuel Rabinovich put hate in the same-old perspective during his keynote speech at the Emergency Council of European Rabbis, in Hungary. They were to recapitulate the principle steps of their new program. He’s really talking about the Protocols of the Elders of Zion, and their plan to turn every Zionist counterfeit-Jew into a king, and every gentile into a slave. Unfortunately, they’ve got their facts wrong. THEY are the gentiles (Ashkenazi and Idumeans) who are enslaving true Israelites, descendants of Jacob’s 12 sons. The analysis/comparison of what was happening in the skies to what was happening in world history could similarly be brought to this day, time period. Usually when something evil is happening; something divinely good is happening, and visa versa. We are in a war of good vs. evil – God vs. Satan. “Remember ye and return to The Law of Moses My servant, which I commanded unto him in Horeb for all Israel, [with] the Statutes and Judgments. Behold, I will send you Elijah the Prophet before the coming of the great and dreadful Day of the “I AM” (Sura 43:61): And he shall turn the heart of the fathers to the children, and the heart of the children to their fathers, lest I come and smite the earth with a curse (Malachi 4: 4-6).” We are in the days of Elijah, the seventh angel. 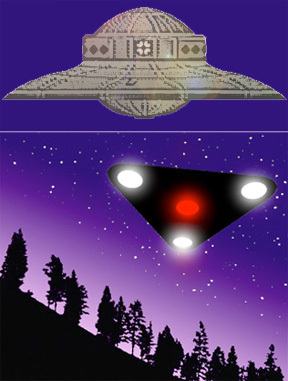 The greatest UFO story ever told isn’t this one, it’s in the Bible. Read yours today. The very best Bible is “The King of kings’ Bible”.